Get ready, Zac, because we're taking it way back. After becoming a pop culture sensation thanks to his turn as Troy Bolton in High School Musical, 17 Again proved to be the first real test of Zac Efron's leading man potential on the big screen back in 2009. Spoiler alert: It was a hit, debuting at No. 1 before going on to make almost $140 million, officially cementing Efron's star power without the Wildcats jersey on. In the comedy, Efron plays the younger version of Matthew Perry's Mike O'Donnell, whose life is falling apart at the age of 37. When he makes a wish to go back to high school and try to relive his glory days, the Friends star transforms into the Hairspray hunk. Shenanigans, laughs and life lessons ensue. Since 17 Again, Efron has gone on to star in hit films like Neighbors and The Greatest Showman, and his turn as serial killer Ted Bundy in Extremely Wicked, Shockingly Evil, and Vile is set to hit Netflix on May 3. 1. Efron didn't originally want to do the movie. Not because he didn't like it; he just didn't think he had the chops to pull it off when he first heard the idea from producer Adam Shankman while they were working on Hairspray. "I thought he was crazy," Efron told Tribute Movies. "I was like, ‘What on earth makes you think I am up for the challenge of playing a 37-year-old? It was weird, I didn't enjoy the concept at first...then the script came in, I read it and I was actually impressed." 2. Given that he was a Friends fan, Efron didn't feel the need to rewatch old episodes of the iconic series to learn some of Perry's trademark mannerisms. Instead, Perry acted out many of the scenes Efron was in during rehearsals, so the younger actor could get an idea of how he would play it. "He's got incredible timing. We rehearsed a lot together, and Matthew was always available to hang out and work with me on my part," Efron said at the time. "And we kind of did become friends during filming." 3. But he also called Perry with any questions he had. "I was at a Christmas party and hanging out with some friends, and my phone rang and made me the envy of every young girl in the world, because it was Zac Efron," Perry recalled. "I was like, 'Guys, guys!' I think he was doing a scene with Leslie, and he said, 'So here's the thing: I need to say this, and how would you say this?' And I said it into my phone, and then six months later, I saw it coming out of his mouth." Hey, they say imitation is the sincerest form of flattery. 4. Given his basketballs skills in High School Musical, it made sense that the writers would make his character Mike a star baller, right? Turns out, it was in the script before Efron signed on...something he was definitely grateful for. "I'm going to be honest—it was a plus," he said. "Like, all right, I can play basketball, and it's a sport I feel you can show off in—which is important for this character and the movie. A pet peeve of mine is when people can't actually do the sport that they are supposed to play on camera, so it's nice to play basketball." Someone who needed a basketball lesson or two? Perry! 5. Hunter Parrish, who played Stan, Mike's daughter's sketchy boyfriend in the movie's present-day timeline, actually was Efron's real-life rival…when it came to auditioning for High School Musical. "It was down to five guys and then I got offered a part in this amazing Robin Williams movie. And I thought to myself: fly to Vancouver and meet the director for this Robin Williams movie, or stay and finish the auditions for the Disney Chanel movie? So I didn't even go to the last audition. I heard a rumor that I was their favorite, but I never made it to the end," the Weeds star revealed to GQ in 2009. He then joked it was "kind of awesome" to get to beat up Efron as the 17 Again antagonist. 6. Back in 2009, there was no teen heartthrob that could match Efron's status. Two of his biggest fans? Onscreen love interest's Leslie Mann's daughters, Maude and Iris, who came to set to meet their celeb crush, but he ended up gushing over their work instead. "They were sweethearts, I just told then, 'I'm fans of you guys, you were so good in Knocked Up," he recalled. "Cute little kids!" 7. In case there was any doubt in how big of fan Maude was of the actor at the time, let Mann's retelling of the then 10-year-old's response to her kissing scene with Efron convince you. "We got to kiss, which was very exciting for Maude," she said on Ellen, "when I got home from work from doing the kissing scene, she ran up to me and …licked my face because she wanted to taste Zac Efron's spit." Her husband Judd Apatow was decidedly less enthusiastic about his wife swapping spit with Efron, telling the Denver Post, "I don't appreciate her kissing Zac Efron—I can live without that. But I thought the movie was great. See, Leslie is such a good actress, she can even look like she's in love with an incredibly handsome 21-year-old man." 8. 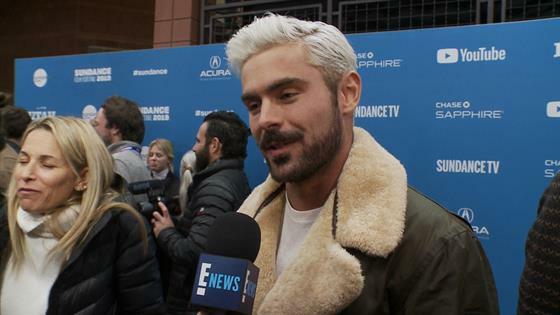 While Mann's daughters were nursing serious crushes on Efron, it turns out Efron, who was famously dating High School Musical co-star Vanessa Hudgens at the time (RIP Zanessa!) had a bit of a crush on their mom. "I've had a crush on Leslie since I was ten years old," Efron revealed to SheKnows. "George of the Jungle was my favorite movie and she was amazing. I was so thrilled (she was) going to play this part, because I knew it wouldn't be weird." He went on to call the kissing scene "very easy" in an interview with Elle. "I didn't have to fake it." 9. The filmmakers originally has discussions about making Efron's Mike 18 instead of 17 in the name of, you know, making the love story less illegal. "We talked about that, about making him 18," Mann revealed to MovieWeb. "For my storyline with him, if he's 18 then it's OK because he's an adult and I wouldn't go to jail. But then they decided no." The reasoning was actually pretty simple: There was already a movie called 18 Again! that came out in 1988, in which an 81-year-old grandfather swaps bodies with his 18-year-old grandson. 10. Thomas Lennon, who plays Ned, Mike's nerdy best friend in the film, had worked with Perry before and after 17 Again. Sort of. Lennon briefly made an appearance on Friends in 1994, playing a blackjack dealer in "The One in Vegas" Part One." Alas, they did not share a scene, as Lennon's character was Joey's (Matt LeBlanc) "hand twin." But in 2015, they starred in CBS' remake of The Odd Couple, with Perry taking on Oscar and Lennon playing Felix. The sitcom ran for three seasons. 11. Before she became the HWIC in Mystic Falls on The Vampire Diaries, Kat Graham has a supporting role as Jamie, one of Mike's daughter's friends who tries to impress him throughout the movie...until she slaps him. On Twitter back in 2010, Graham revealed the slap was very real. I really slapped him btw," she wrote to a fan. "Zac wanted it to look real." 13. Sterling Knight, a fellow Disney Channel heartthrob (Sonny With a Chance and the TV movie Starstruck) played Mike's son in the film, actually had a previous encounter with Efron...and it wasn't exactly Disney-friendly, as Knight revealed he has also auditioned for HSM as a struggling young actor and maybe harbored some jealousy toward Efron, which came out when he randomly ran into him one day, finding Efron in the back of his truck looking for a hacky sack. 14. For the role of Mike's daughter, who would end up with a crush on young Mike, not realizing it's her dad, producers had the hard challenge of finding someone Efron's age who he didn't have chemistry with. Enter: Gossip Girl's Michelle Trachtenberg. "It was really important to us in finding the girl that she had no chemistry with Zac," producer Jennifer Gibgot explained. "There were certain girls that we brought in to read for that role and we actually had to read them together because they literally wanted to jump his bones. So he and Michelle had no chemistry, so it worked." Shankman clarified, "They had less overtly sexual chemistry. They had chemistry as people; they didn't have chemistry sexually." 15. Back in the day, Efron invited the two women who ran his fan site (then called Charismatic) to the set to finally meet in person after developing a friendship with them over phone calls and e-mails. Efron had previously extended them an invitation to attend the premiere of Hairspray, but it didn't work out. After finally meeting on the set, he then invited them to lunch, with Seventeen being on set to document the big meeting. 16. In 2015, a musical adaptation of 17 Again was planned, with Glee's Darren Criss and The Flash's Andy Mientus both taking part in a reading to see if the project would move forward, potentially landing on Broadway. In 2018, the musical was included in NAMT's 30th Annual Festival of New Musicals' showcase. 17. While filming the movie, Efron ended up being rushed to the hospital to have his appendix removed. Lennon, however, didn't realize how serious Efron's pain was, thinking it was just gas. "I didn't know what it was at the time and I was just trying to get through a day's work. Thomas kept telling me, 'Dude, just eat some Beano...it's gas, eat Beano,'" Efron told The LA Times. "And I'm like, 'I don't think so, it doesn't hurt like that.' And he's like, 'No, I swear, if the worst comes to the worst, hang upside down.' "That was Tom's advice. He's like, 'Go hang upside down in your trailer,' and I'm like, 'What?" He didn't follow his co-star's advice, going to the hospital after taking to his dad on the phone. "I fell asleep and, when I woke up, I was completely soaked from head to toe because I was sweating. I was like, 'Something's definitely wrong,' and I looked in the mirror and my eyes were like bloodshot and I was very pale," he continued. "I was like, 'Hmm, something might be off here.' So that's when I called my dad and I was like, 'Hey, Dad, what do I do for extreme stomach pain?' And he said, 'You go to the hospital.'" Mann recalled the surprise surgery, which happened early on during production. "The first week we were working together he was having stomach pains; he was doubled-over between takes," Mann told MTV. "The next day, we found out that his appendix burst. He went to the hospital and had it taken care of, and he was back at work the next day!"